I pulled into Eastlake Park bright and early, water bottle, gloves, towels, and fresh resolve in hand, ready to spend a day sprucing up a part of the Magic City to honor September 11th National Day of Service and kickoff Birmingham’s 50 Years Forward Empowerment Week. In the morning sunlight, the park looked serene, with active residents making their way around the lake path, already sweating as the temperature began to rise. This was the first time I had ever participated in a community-wide day of service in my home city, and I was proud to do it as both a lifetime resident and a newly minted AmeriCorps member for 2013-2014. As a member, I have the privilege to serve with the Conservation Alabama Foundation as a Programs and Outreach Assistant, so last Wednesday my mind was connecting ideas about our built environment, beautification, and social justice. Despite my self-proclaimed status as a life-long Birminghamian, I have only recently returned from a six year stint in higher education; four years in Tuscaloosa and almost two years in Pennsylvania. I graduated from the University of Alabama with degrees in philosophy and history, and have recently completed my Master’s degree in American Studies from Penn State. My brief stay in Pennsylvania exposed me to a new environment, one in which I was an outsider, so I saw many cultural and political nuances that made me realize how ignorant I was regarding the lay-of-the-land back home in Birmingham and the South. Seeing the social and environmental struggles happening in Pennsylvania opened my eyes to a new way to look at my hometown: as a city and a state that had the potential to be on the forefront of so much beneficial change in the southeastern region. So I returned in June of this year, excited to join in Birmingham’s ongoing revitalization effort. 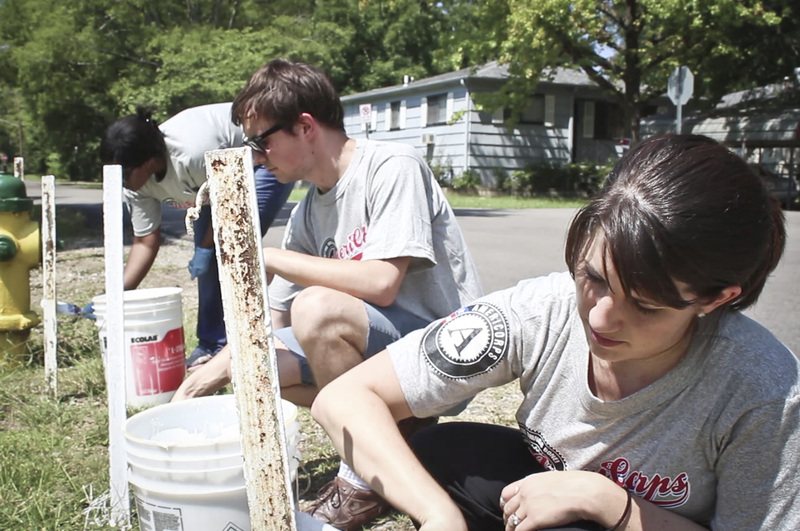 Once everyone arrived, my fellow AmeriCorps members and I rolled up our sleeves and got to work. Birmingham Public Works gave us mulch and top-soil while others procured trash-bags from the recreation office to pick up litter around the parking lot and play-ground area. A couple of other members and I started scraping the bollards next to the road leading into the park. Folks from Alabama and the South know that even in September, working outside can be taxing. As the sun beat down on us, and the old white paint sometimes refused to come off easily, I experienced a mild feeling of futility. Our group had to be back to our home base at the YWCA of Central Alabama in downtown Birmingham later that afternoon, so we were racing against the clock, and were waiting on more supplies. AmeriCorps has practically fed me fresh optimism through an IV, yet as I scraped rust and old paint off of poles sticking out of the ground, I also felt like maybe our efforts weren’t ambitious enough. I had never been to Eastlake park before, and was genuinely impressed with its layout and size. Residents were obviously encouraged to exercise, socialize, and enjoy a shared space. People fished in the large central lake while others sat under a gazebo and enjoyed a lazy Wednesday. The recreation office housed older men and women who played cards and ate lunch, their jokes echoing down the hallway. Part of me wanted to stay as long as it took to make the entire park spotless, painted, shiny, and like-new. More scrapers arrived along with a large plastic bucket of fresh white paint and by the time our little group finished painting the entrance poles leading up to the parking lot, my perfectionism had softened. With just that fresh coat, the bollards did look so nice and pristine and clean, accenting the beautiful lawn and the shady playground area they protected from the potential onslaught of motor vehicles. Before we could even start on the others across the street, we had to head back downtown for some well-deserved rest and debriefing from our YW coordinators. I was glad for a break, but still felt a bit guilty leaving the effort unfinished. Sometimes, there just aren’t enough hours in the day. As I begin my service with Conservation Alabama Foundation, I am reminded of how powerful these small efforts at beautification and improvement can be. One gentleman golfing in the park thanked us for volunteering and told us about his own experience serving with the Corps, validating an early lesson I have learned: people respond when they see that you care, that you care about where you live, where you work, and who lives around you. In my brief experience, I see that people here really care about Birmingham, and about Alabama. I know I do! My small mission during my year of service will be to help Conservation Alabama Foundation, along with its partners around the greater Birmingham area, move forward in its institutional goal of protecting the people and places we love here in the Magic City and across the state. I am proud to be a part of it, and will absolutely do my best, even if the overall project remains unfinished at the end of my tenure. I’m just here to scrape the bollards.